The weather has really changed here in Northern California. Soup weather! Here is a recipe that I did for the Alaska Seafood Marketing Institute that would be perfect for this time of year. 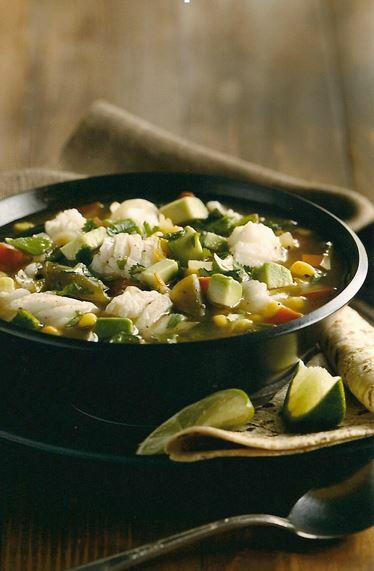 This healthy Mexican-inspired soup is very simple, delicious and quickly put together. To get even more corn flavor, simmer the corn cobs in the stock for a few minutes. Discard them before adding stock to recipe. Fresh poblano chiles are widely available and often wrongly called pasilla in many supermarkets. Any meaty whitefish will do in this recipe such as halibut or black cod. Just don’t overcook it! In a soup pot add the oil and over moderate heat cook the onions, garlic and chiles until just beginning to color, about 6 minutes. Add the stock and tomatillos and simmer for 5 minutes or so until vegetables are just tender. Add the fish and corn and continue to simmer until fish is just cooked through, about 4 minutes. You can add a bit more stock if needed to cover the fish. Add the tomatoes, season to your taste with salt and pepper. Divide the avocado and cilantro among 4 bowls. Ladle hot soup over and serve immediately.